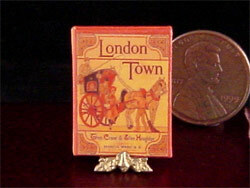 These beautiful readable miniature books have hardbound covers with printed text and superb graphics. 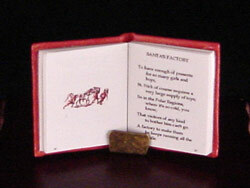 I make each book myself by hand, with utmost attention to detail. 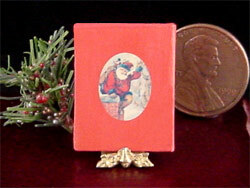 True treasures for your miniature library! 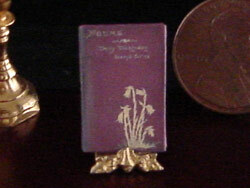 Handmade 1"-scale miniature edition of Emily Dickinson's Poems: Second Series. 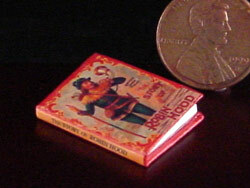 I have abridged the text for this miniature version to keep the scale of the book realistic. It contains Part 1 of the original, "Life." 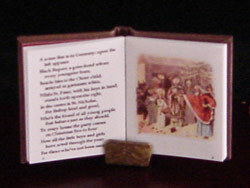 It features a portrait of Dickinson as a frontispiece, the original-edition cover art, and lovely endpapers. 21 pages long including the frontispiece and title page. The text is readable with a magnifying glass. 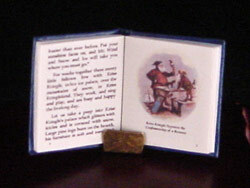 Hardbound cover and decorative endpapers. 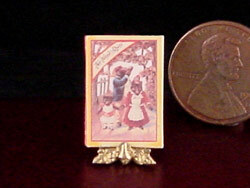 ¾" tall (19mm). 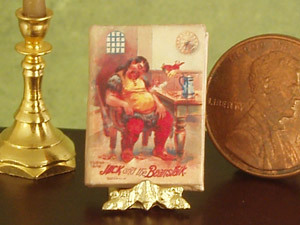 A charming handmade 1:12th-scale miniature version of Jack & the Beanstalk. 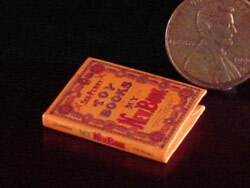 The original was published in 1897 by McLoughlin Brothers. 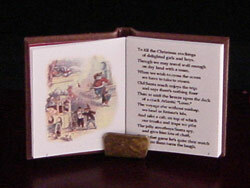 It features beautiful Victorian artwork and readable text. 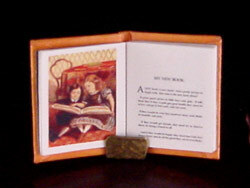 11 pages long with a hardbound cover and decorative endpapers. 13/16" tall (20mm). 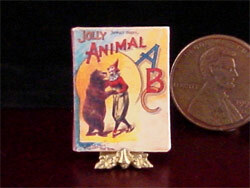 1:12 scale miniature version of Jolly Animal ABC. The original was published in 1890. 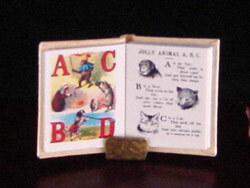 It features beautiful Victorian artwork of animals illustrating each letter of the alphabet and full-color circus illustrations on the front and back covers. 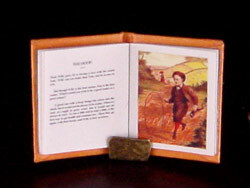 14 pages long, with six full-page color pictures, 26 smaller black-and-white images, and decorative endpapers. &frac78;" tall (22mm). 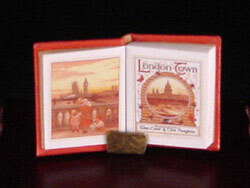 A beautiful handmade miniature version of London Town, with verses by Felix Leigh and lavishly illustrated by Thomas Crane & Ellen Houghton. The original was published in 1883 by Marcus Ward & Co. Pictures and verse portray well-known Victorian London attractions and characters. 30 pages long, including 2 frontispiece illustration pages, title page, and table of contents. It has decorative endpapers and a hardbound cover. 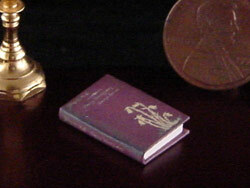 15/16" tall (24mm). 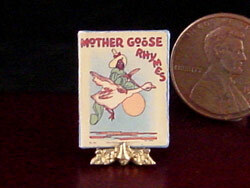 Handmade 1:12th-scale version of Mother Goose Rhymes, originally published by The Platt & Munk Company in 1930. 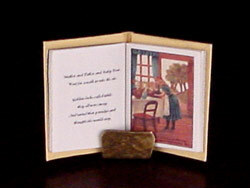 Charming drawings by Lois Lensky illustrate the traditional rhymes. 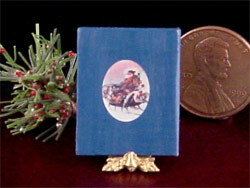 12 pages long with 11 full-page color pictures, decorative endpapers, and a hardbound cover. 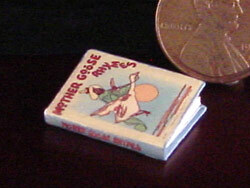 The text is readable with a magnifying glass. ¾" tall (19mm). 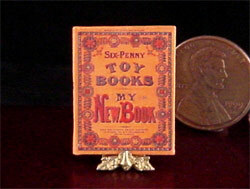 1:12th-scale version of My New Book from the 'Six-Penny Toy Books' series published circa 1880. Lovely pictures of Victorian children at play illustrate such stories as "The Skipping Rope," "The Shower of Rain," and "Keeping School." 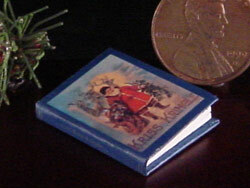 13 pages long with six full-page color pictures, decorative endpapers, and a hardbound cover. The text is readable with a magnifying glass. 15/16" tall (24mm). 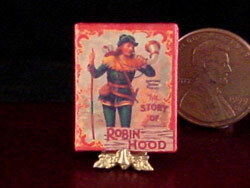 Handmade 1"-scale version of The Story of Robin Hood published by the McLoughlin Brothers Company in 1889. 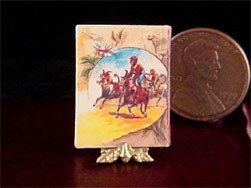 The classic story is brought to life with vivid illustrations of the adventures of Robin and his Merry Men. 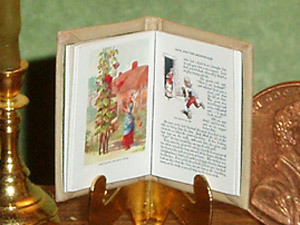 14 pages long with four full-page color pictures, a gorgeous full-color two-page panoramic illustration, and 9 smaller red-and-black pictures throughout the story. It has decorative endpapers and a hardbound cover. &frac78;" tall (22mm). 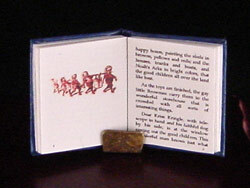 A handmade miniature version of an antique storybook The Three Bears. 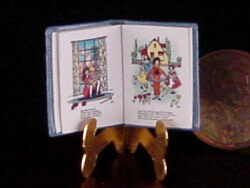 The story is told in verse, with charming illustrations on each page..
14 pages long including the title page, with six full-page color pictures. 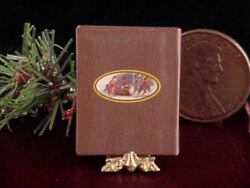 It has a hardbound cover and decorative endpapers. 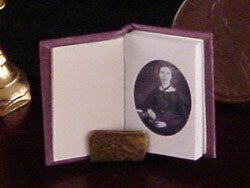 ¾" tall (19mm). 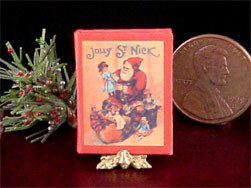 Handmade 1"-scale version of Jolly St. Nick. 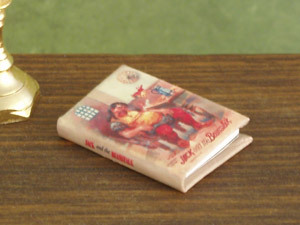 The original was published in the late 1890s by the Ernest Nister Company of London, one of the leading printers of color lithograph books for children in the late 19th century. 26 pages long, including the frontispiece and title page. 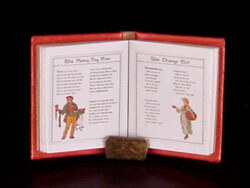 Readable text with five full-color pictures and two smaller red-and-black images. 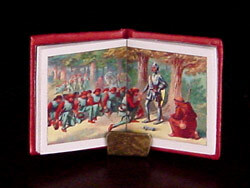 Hardbound cover and decorative endpapers. 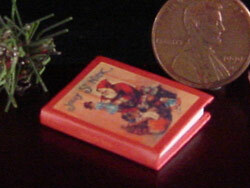 15/16" tall (24mm). 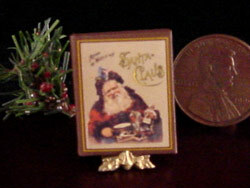 Handmade 1"-scale version of Kriss Kringle. 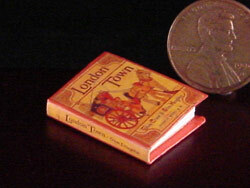 The original was published in 1897 by the Ernest Nister Company of London, one of the leading printers of color lithograph books for children in the late 19th century. 22 pages long, including the frontispiece and title page. 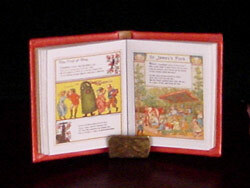 Readable text with six full-color pictures and three smaller red-and-black images. 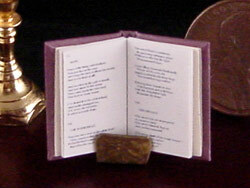 Hardbound cover and decorative endpapers. 15/16" tall (24mm). 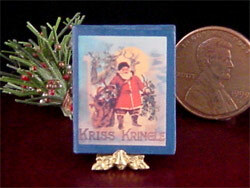 Handmade 1"-scale version of Kriss Kringle. 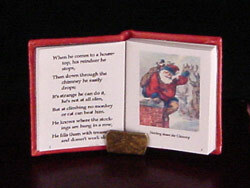 The original was published in 1849 by the McLoughlin Brothers Company, one of the leading 19th-century printers of color lithograph books for children. 21 pages long including the title page. 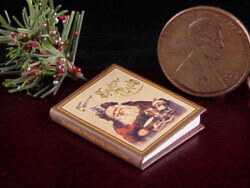 Readable text with eight full-page, full-color pictures of Santa's world travels. 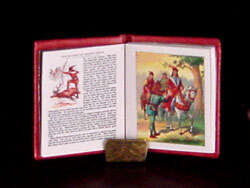 Hardbound cover and decorative endpapers. 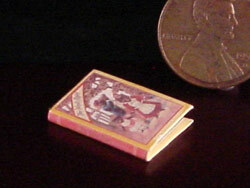 15/16" tall (24mm).